The short answer is: A lot less if you mediate than if you litigate. A good rule of thumb is that mediation will cost only about one-third of what it would cost to have the same case go to trial with lawyers. 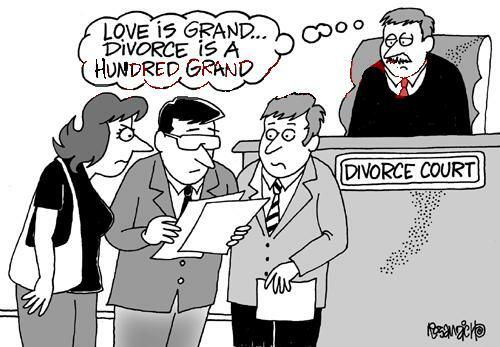 If you are considering a divorce or already involved in one, you probably know how expensive it can be. A single day in court, much of it spent waiting around for a few minutes with a very busy Judge, would cost more than five full sessions with a mediator. Often the savings are even higher. At Settlement Works, our process is designed to be time efficient and cost effective - especially when compared to the costs of going to court. So if you have a simple case, such as determining the amount of support, going to court with lawyers could easily be as high as $7,000. By contrast, the typical Settlement Works charge would be $1,400 or less, (one three hour session with an attorney @ $350/hour, plus a $350 documentation expense). At the other extreme, a litigated custody dispute usually costs at least $50,000 and can often go far beyond $100,000. Tragic, and all too common. Resolving those same issues, through six full sessions of the Settlement Works process, with an Attorney and a Therapist would cost (combined rate of $500 per hour) would cost about $9,000. That's still a lot of money, but it's less than 10% of what that case would cost in court. Plus, in mediation the cost savings are usually accompanied by reduced stress and less emotional upheaval. Saving time, energy AND money are just some of the benefits of resolving your own case, rather than turning it over to attorneys and the busy court system. Our fees are billed at $350 per hour for attorneys and $150 per hour for therapists. The fee for preparation of a formal document to be submitted to the Court and other time spent outside of mediation (phone calls, correspondence, etc.) is charged at the rate of $350 an hour. There is of course a filing fee charged by the Court. Currently that fee is $435, usually for each party. However, if the parties work out their agreement and sign the document together, only one spouse is required to file papers with the court and pay a filing fee, a savings of $435. The foregoing fees are examples and estimates. There is no way of predicting the exact cost of your case, for the obvious reason that a great deal is up to you. The more you and your spouse cooperate, exchange financial forms and information and work at compromising, the quicker and more economically your case can be settled. We strive to empower our clients to take an active part in determining how they want their financial issues and parenting plans to be resolved. To support our clients we do not require a retainer fee for our services. We have a pay as you go policy which means payment is expected at the conclusion of each mediation session. Mediation fees are usually split evenly between the parties, although a different division of fees can be arranged by agreement. © 2019 Settlementworks. All Rights Reserved.